I have always loved being by the river in London. There’s something special about a tidal river, especially one that smells of the sea right in the middle of a big city, the sea that’s almost 50 miles away. It smells of adventure and history and the most mundane moments of being human. It’s constantly changing, with the ebb and flow of the tide, and the ebb and flow of the skyline surrounding it, as buildings go up and come down and are replaced by new buildings that go up and come down, it’s no wonder that I’ve found myself continually drawn to its edges. 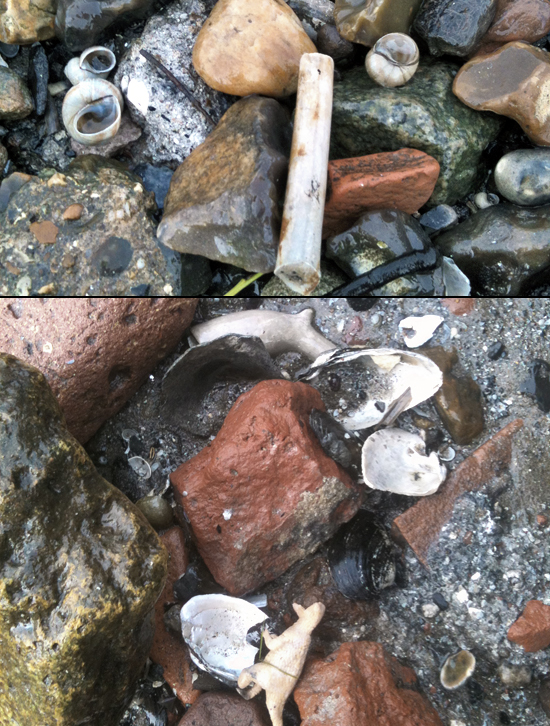 A couple of minutes on the foreshore in front of the Tate, and I’d already spotted some old clay pipe pieces. These date from the 1700s up until the 1880s, when cigarettes became more popular. Parts of the broken pipe-stems are really common, the pipe-bowls less so, especially intact bowls — so I was quite lucky with that one! There’s always interesting flotsam if you look. I like to spot interesting rocks and stones (everybody needs a rock). The egg-like one pictured below resembles one of the ceramic “river eggs” that an artist put into the Thames in 2012 (there’s a picture here for you to compare), but it was actually flint (one side had chipped off). The other one was a nodule of tar I think, but with something of a different texture that has sort of woven itself in. Surprisingly lightweight, but hefty enough to be an interesting paperweight! 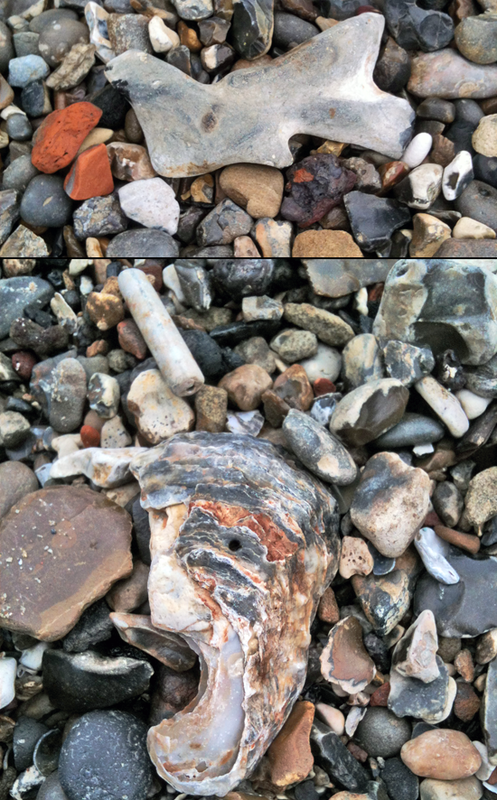 A piece of flint that looks like a Picasso dove, and a shell face that’s yawning or screaming — and another piece of pipe-stem. 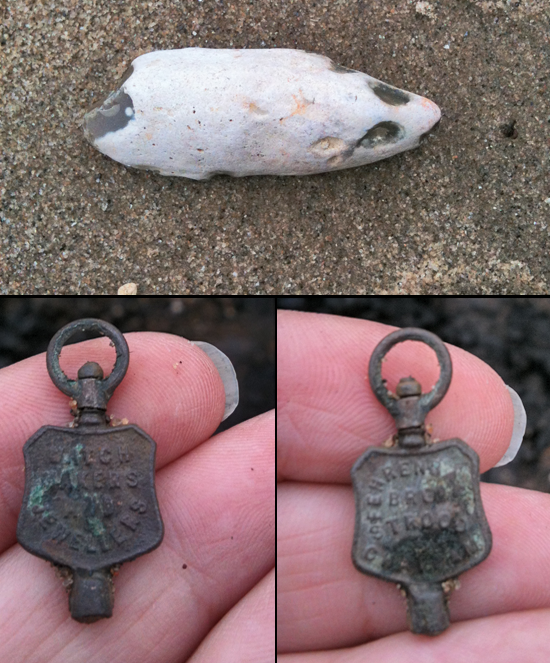 a piece of flint that looks like a sugar mouse with the tail end bitten off, and a piece of a pocket watch — one side says “watch makers and jewellers” and the other side says “Fehrenbach Bros Strood & Chatham”. I met some proper mudlarkers in front of the OXO Tower, who were very friendly so we had a nice chat before I wended on my way. One of them dug up the top of a watch-fob while I was there. The fun thing about finding stuff like that these days is it’s so much easier to research — a quick google shows that the Fehrenbachs were quite a famous German clock-making family, with shops all over the place, including Scotland and Manchester. When WW2 came, they changed their name to Fernbank and continued to make clocks and watches, but they also made bullets (for the British side). The tide didn’t seem to move while I was down on the foreshore, but when any big boats came past they quicky caused a swell. Luckily I happened to be standing on a big rock when this one happened — but then again jumping to avoid getting your feet wet is part of the joy of being by a tidal river. That rather phallic-looking thing is an animal bone of some sort, they’re quite common to find. And that skirt is a new-old find of mine, I actually bought it back in the 90s (!) but it’s been lurking in my fabric stash for years. A little while ago I altered it to make the waist smaller and now it hangs better so I’ve worn it quite a few times lately. I didn’t have enough energy to wend my way back to the Tate for the exhibition, but I did end up collecting some nice bits and pieces, including about 40 pieces of pipe-stems (I don’t usually collect them, but this time I decided I would! ), and some pretty sherds of broken crockery (I recently learned that “sherds” is the name for bits of broken crockery, “shards” just applies to broken glass). I always have a soft spot for those little fragments of pretty plates just for themselves (I find them all over Hampstead Heath, too), but I recently discovered that a lot of the pieces I’ve found over the years are probably a couple of hundred years older than I assumed they were. It’s funny how rubbish that’s three hundred years old somehow becomes special to people, even though it’s still just rubbish. But the rocks and broken plates on the foreshore will always be special to me. I love a spot of beach combing! Here in the Midlands we couldn’t get any further from the sea, how wonderful that you have the tidal Thames to explore. Love the clay pipes – they are still popular here and the watch winder is fantastic, I wonder how the wearer managed to lose it all those years ago? Did he drown? I’m so macabre! Oh my, I would so love to do this! You’ve got some great finds. The piece of pocket watch is fantastic. Is it easy to get down to the shore there? There are staircases down to the shore dotted along the south bank, easiest access is between the Tate and the Royal Festival Hall. Great article and thanks for getting in touch. 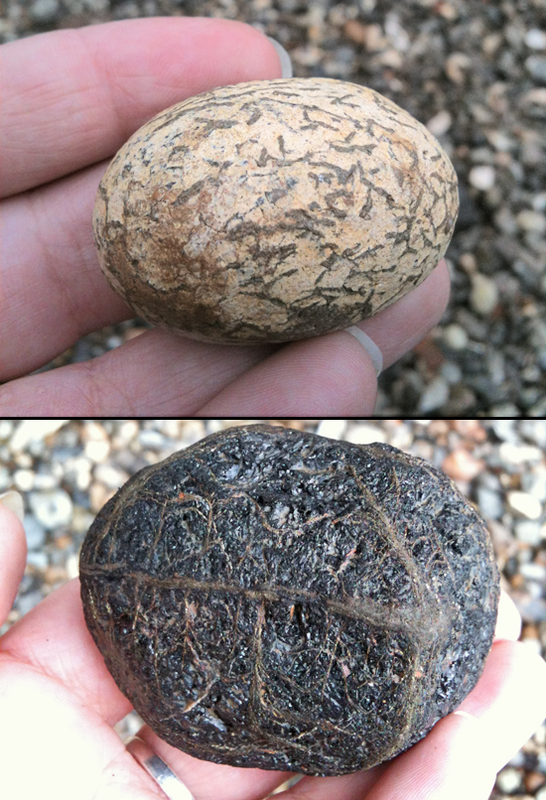 Did you find one of the ceramic eggs by Anon on you riverbank walks? Will look out for those pumps the next time I’m out on the South Bank, hope to meet you at some stage. I LOVE THIS IDEA! Let’s do it! Haha, I just found out that some of the old brick pieces I’ve been dismissing might have been ROMAN. So you never know! And yeah, although those pipe pieces are *so common* that they don’t seem too impressive, the truth is that when you stop to think about how countries like the US and Australia didn’t exist then, it does seem more special!